Picture a world without baseball and jokes. What's life without America's pastime and a little laughter? Not one that the JustBats.com team wants to be a part, that's for sure. 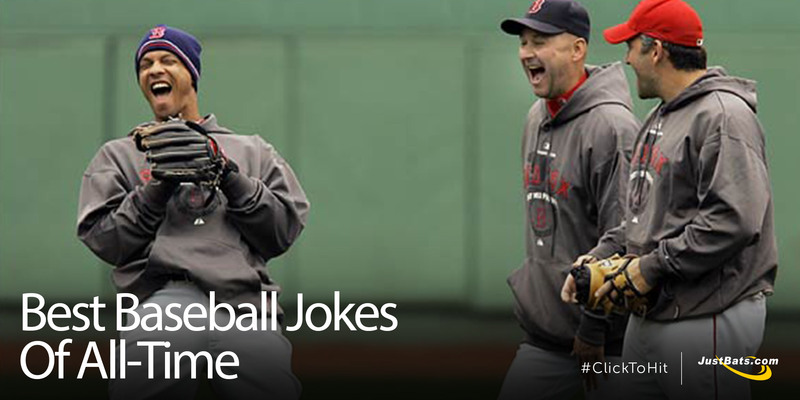 That is why we've compiled the ultimate list of the best baseball jokes of all-time. Sit back, relax, and get ready to laugh.Conversation jokes, knock knock jokes, and one-liners. We've scoured the Internet for the best jokes about baseball that we could find and have compiled them all for your reading pleasure. These are in no particular order, and we hope that they all bring you joy and laughter. JustBats: What did the baseball glove say to the ball? Fan: Hmm. I don't know. JustBats: Which position is the best water boy? Fan: I'm not sure. Which one? JustBats: Why are baseball games at night? Fan: Good question. Why are they? JustBats: Because bats are nocturnal! JustBats: When does royalty watch a baseball game? JustBats: When it is a knight game! JustBats: Why are frogs good baseball players? Fan: I haven't the slightest idea. Why are they? JustBats: Because they're great at catching flies! JustBats: What have 18 legs, spits uncontrollably, and catches flies? JustBats: Why was Cinderella taken out of the game by her manager? Fan: No idea. Why was she? JustBats: Because she ran away from the ball! JustBats: How come Cinderella was so bad at baseball? Fan: Because she only had one shoe? JustBats: Close! Because she had a pumpkin for a coach. JustBats: Why did the police officer rush to the baseball game? Fan: Because he loves baseball? JustBats: Good guess! But it was because someone stole second base! JustBats: Why do girls like baseball? JustBats: Because diamonds are a girl's best friend! JustBats: How do baseball players keep in touch? JustBats: They touch base every once in a while. JustBats: What do baseball players use to make a birthday cake? JustBats: Oven mitts, bunt pans, and batter. JustBats: A man leaves home, takes three left turns, and is on his way back home when he sees two men in masks waiting for him. Who are they? JustBats: The catcher and the umpire! JustBats: What's the difference between my favorite stadium's hot dog and your favorite stadium's hot dog? JustBats: You can buy ours in October! JustBats: What do a great hitter and a boxer have in common? JustBats: They are both sluggers! JustBats: What do you get when you cross a tree with a Hall of Fame baseball player? JustBats: Why did the owner of a bakery hire a pitcher? Fan: I have no idea. JustBats: Because he knows how to handle batter. JustBats: Why did the baseball player put springs on his cleats? JustBats: He was getting ready for spring training! JustBats: Why is it a bad idea to play baseball in the jungle? Fan: Because there is no field? JustBats: Because there are too many cheetahs! JustBats: Why were there cattle on the ball field? Fan: To eat the grass? JustBats: They were looking for the bull pen! JustBats: When is it the hottest in a baseball stadium? JustBats: When all of the fans have left! JustBats: Why is it so hard to steal third base? Fan: Because the defense is too good? JustBats: Because of the short stop. JustBats: What position is Dracula on the baseball team? JustBats: Good guess! He's the bat boy! JustBats: Why are umpires so big? Fan: Because of all the gear? JustBats: Because they always clean their plate! JustBats: Why was second base so sad? Fan: Because he kept getting stepped on? JustBats: Because he would never be first! JustBats: Did you hear the joke about the fast pitch? JustBats: Nevermind. You just missed it. JustBats: Did you hear the joke about the pop fly? JustBats: Don't worry about it. It's way over your head. JustBats: Does it take longer to run from first to second base or from second to third base? JustBats: It takes longer from second to third base because there is a shortstop in the middle. JustBats: Which superhero is the best baseball player? JustBats: Why did the boy hang upside down from the dugout ceiling? Fan: Because he snuck in? JustBats: Because he was a batboy! JustBats: Why did the baseball player decide to shut down his website? Fan: Why did he shut it down? JustBats: Because he wasn't getting any hits! JustBats: Why are singers good at baseball? JustBats: Because they have perfect pitch! JustBats: What do you get when you cross a baseball player with a monster? JustBats: Why don't matches play baseball? Fan: Because they're on fire? JustBats: Because they get one strike and they're out! JustBats: Where do coal miners play baseball? JustBats: In the miner Leagues! JustBats: Where does a catcher sit for dinner? JustBats: Why is it smart to bring a baseball player when you go camping? Fan: Because they're good company? JustBats: Nope. So that they can pitch the tent! JustBats: Have you read all of these baseball jokes? JustBats: Because they'll leave you in stitches! Bob led his team in steals until he got arrest for burglary. I used to collect bats, but then they got free and flew away. Baseball is 90% mental, and the other half is physical. A group of kids was playing in a farm field, and one of them hit a chicken with a baseball and then proceeded to yell, "Fowl ball!" Why do we always sing "Take Me Out To The Ball Game" when we're already there? Why is it called the World Series if the only team from North America and Canada are playing? When you start a game, they don't say "Work ball!" They say "Play ball!" A hot dog at a baseball game beats prime rib at the Ritz. Thou shalt not steal except in baseball. They don't think it be like it is...but it do. Bass-ball is my favorite sport! Bob wasn’t convinced. So Larry asked the dog how sandpaper feels. “O.K., who was the greatest baseball player of all time?” Larry asked the dog. A man is trapped in a house without windows, doors, or any other way of exiting. The house is on fire and has started to collapse, and the man has only a baseball and a bat. How does he get out? He swings at the air three times because in baseball it is one, two, three strikes and you’re out at the ol' ball game! A cocky rookie was pitching in his first ever playoff game. He started out the game with five straight walks, so the manager immediately took him out. As the rookie walked into the dugout, he slammed his glove on the ground and yelled, "That jerk took me out when I had a no-hitter going!" Lastly, but certainly not least, this is for those of you who have never seen the famous duo of Abbott and Costello perform their timeless skit "Who's On First." Revel in the ridiculousness. There you have it. The ultimate online list of baseball jokes. What do you think? Did we leave any out? If you didn't find your favorite baseball joke here, please leave it below in the comments section so that we can add it to the list. Don't forget, if you ever have any baseball bat related questions, you can give our friendly customer coaches a call at 866-321-2287 at any time of the day. You may also shoot them an email at support@justbats.com or click here to live chat. Remember, we're here for you from click to hit!